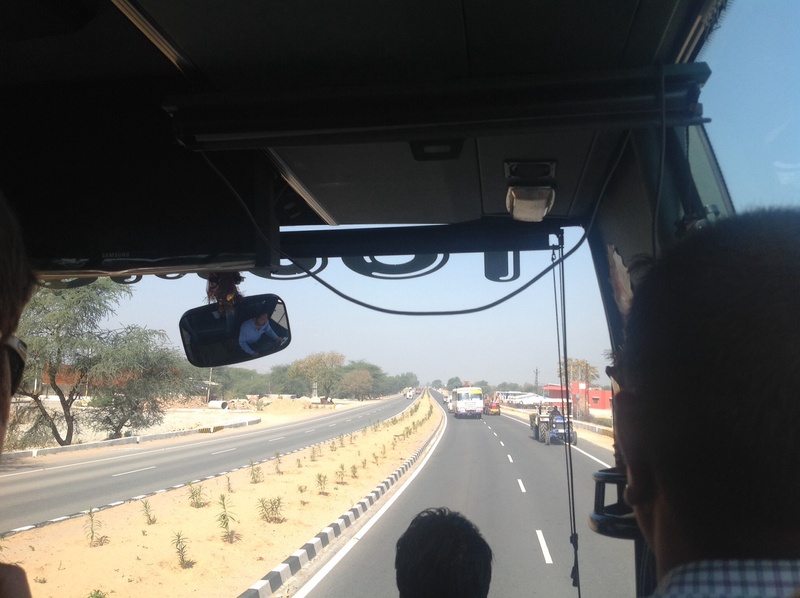 As we hurtled the wrong way down the dual carriageway it became clear that whilst in India they do still drive on the Left, they also drive on the Right. In India it is not a case of ‘as the crow flies’, more a case of ‘how an Indian arrives’. In this particular instance the service station was located on the other side of the dual carriageway and rather than have to proceed to the next turn off and then turn around, our driver employed the ‘drive now think later’ attitude in crossing onto the other side, following the maxim that ‘might is right’. Such assumptions of immortality are natural to all drivers on Indian roads and as a consequence bus drivers in India are heading straight for Nirvana. A joke in India tells of a driver and priest arriving at the Pearly Gates. The priest isn’t admitted, but the driver is, with the explanation that whilst the priest was doing his job everyone was sleeping, but whilst the driver was doing his job, everyone was praying. 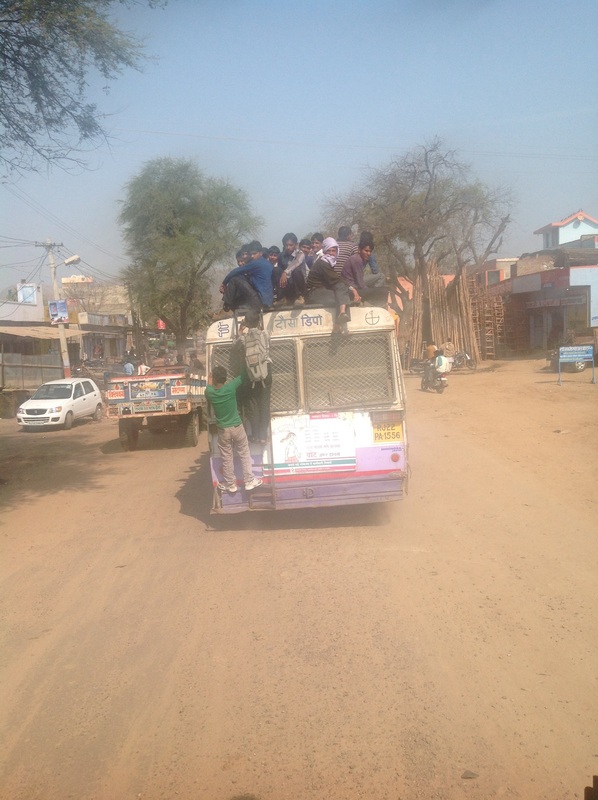 On my first visit to India I remember the bus drivers almost permanently driving on the wrong side of the road and with no seat belts; however, the driver did stop at every Hindu shrine along the way to pray. Given the fact we made it, it is hard to argue which is the more compelling case to be made. Insurance policies are largely regarded as unnecessary in a country where the overwhelming majority of the population is Hindu, with an accompanying belief in reincarnation. Indians must have found the Bond film title ‘You only live twice’ truly baffling .Why worry about your present life when you could be lucky enough to come back as a cow in India? 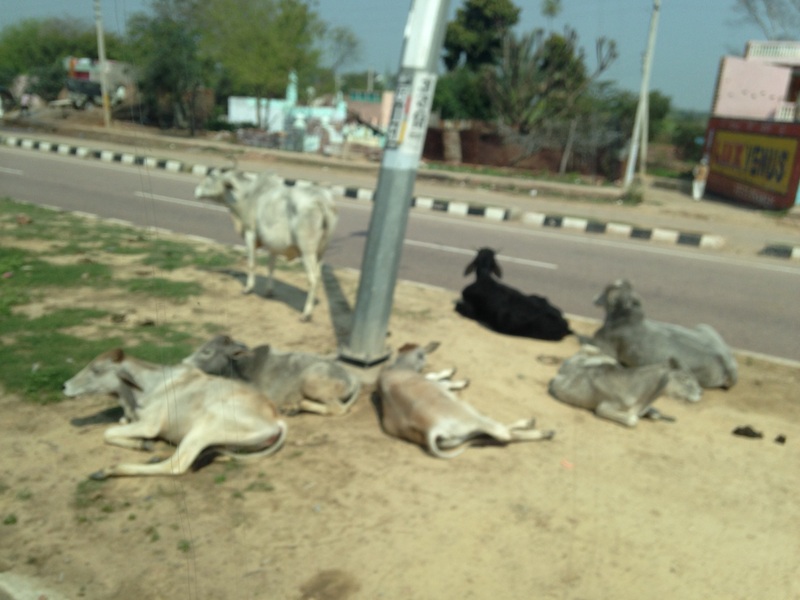 Cows are considered the sacred mother god and are to be seen scattered across the streets of most of India, including lying in the middle of the traffic as 1.2 billion Indians go about their daily business. One of the most fascinating things to do in India is drive or walk around in order to see every aspect of human practices carried out by the side of the road. From the constant brewing of chai to washing in tubs and defecating in the fields, it is there to be witnessed by all who pass by. 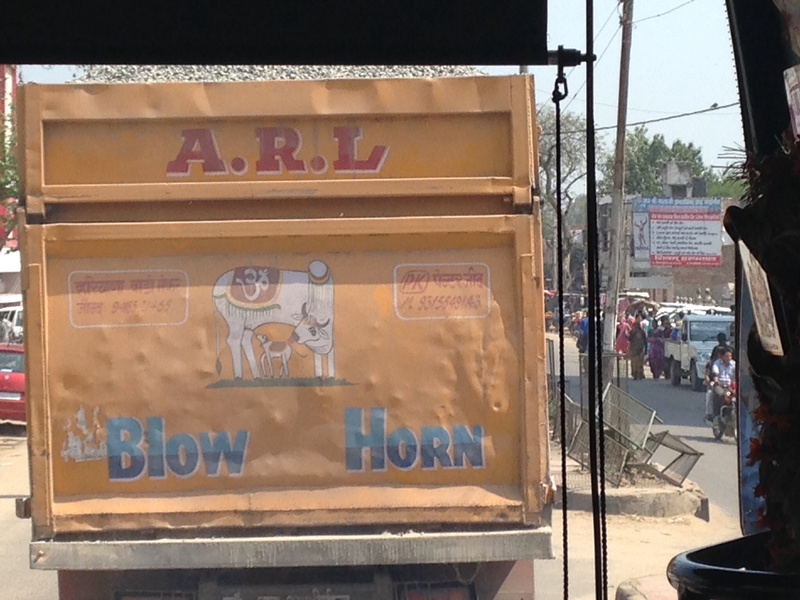 The exhortation to be seen on the back of all large vehicles, to ‘Blow Horn’ is perhaps surprising in a country where all drivers seem to have ‘Horn-blowers’ Tourette’s’. As per Article IV of the Indian Highway Code (please see below) there are several uses of the horn: Cars: Short blasts (urgent) indicate supremacy, ie in clearing dogs, rickshaws and pedestrians from path. Long blasts (desperate) denote supplication, ie to oncoming trucks (I am going too fast to stop, so unless you slow down we both shall die). In extreme cases this may be accompanied by flashing headlights (frantic). Single blast (casual) means: ‘I have seen someone out of India’s 1 billion population whom I recognise’, or ‘I have not blown my horn in several minutes’. Trucks and buses: All horn signals have the same meaning: ‘I have an all-up weight of approximately 12.5 tons and have no intention of stopping, even if I could’. This signal may be emphasised by the use of headlamps. To drive in India therefore, you need a good horn, good luck and a good brake. India set up a ministry of non-conventional energy resources in the early 1980s. In some ways Indians are far ahead of most western countries when it comes to green policies and use of wind and solar power. It might also be suggested that the driving is another ‘non-conventional’ green policy in the guise of population control. Given that there are seven million cars on the road in Delhi alone and a further 7,000 added each week, it is not difficult to see the size of the problem. 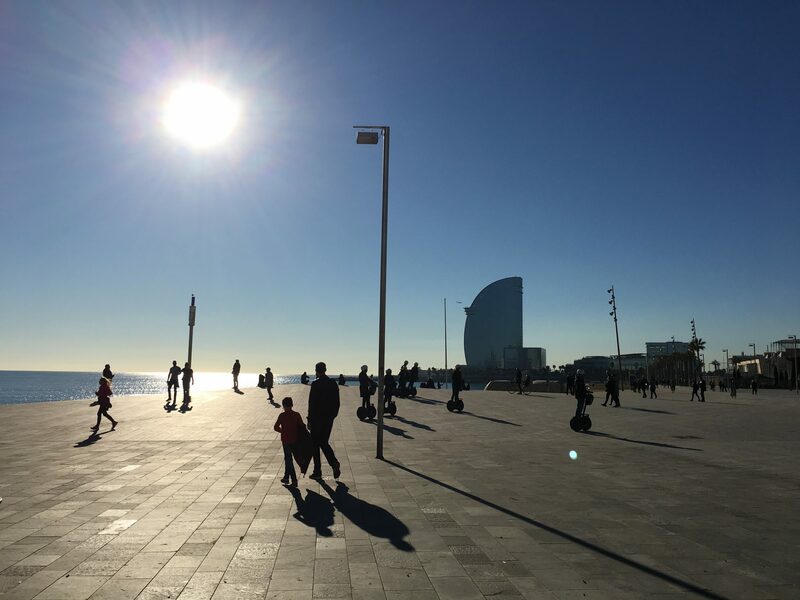 Indian Standard time has much in common with Mexican, Spanish or Italian Standard time, and it would also appear most of India is in a hurry to be late, as is the case in Italy, Spain and Mexico. Many say that we have the government we deserve. I would say that each country has the drivers it deserves. There can surely be no more accurate a reflection of a people than the way it behaves behind the wheel. The North Europeans’ teutonic order reflected in lane discipline. The South Europeans flagrant abuse of rules reflected in its lack of lane discipline. As the below Highway Code (much beloved of local guides and visitors to India alike) indicates, if you really want to know India, you only need take to the road. 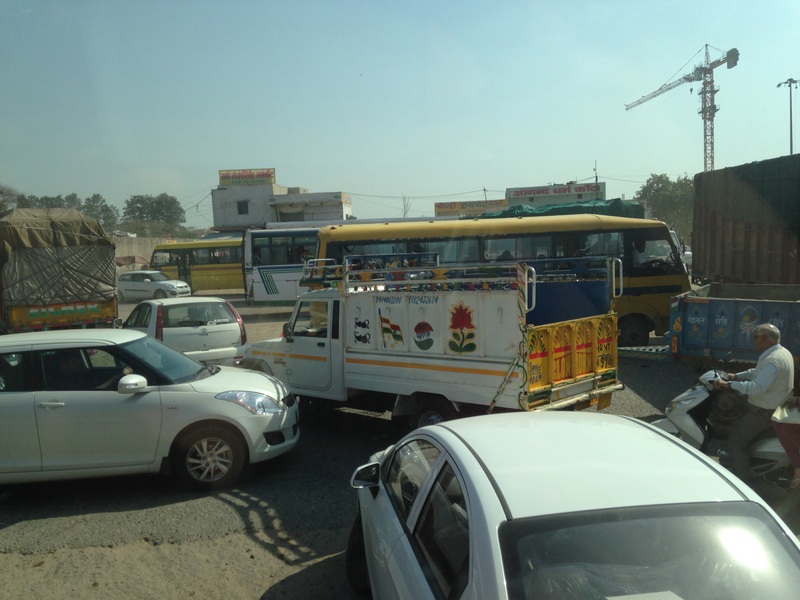 Indian traffic, like Indian society, is structured on a strict caste system. The following precedence must be accorded at all times. In descending order, give way to: cows, elephants, heavy trucks, buses, official cars, camels, light trucks, buffalo, Jeeps, ox-carts, private cars, motorcycles, scooters, auto-rickshaws, pigs, pedal rickshaws, goats, bicycles (goods carrying), handcarts, bicycles (passenger carrying), dogs, pedestrians. Trucks and buses (IV, 2, a): All horn signals have the same meaning, viz, ‘I have an all-up weight of approximately 12 ½ tons and have no intention of stopping, even if I could. ‘This signal may be emphasized by the use of headlamps’. In the absence of seat belts (which is usual) car occupants shall wear garlands of marigolds. These should be kept fastened at all times. Overtaking should only be undertaken in suitable locations, such as in the face of oncoming traffic, on blind bends, at junctions and in the middle of villages/city centres. No more than two inches should be allowed between your vehicle and the one you are passing – one inch in the case of bicycles or pedestrians. The 10th incarnation of God was as an articulated tanker.